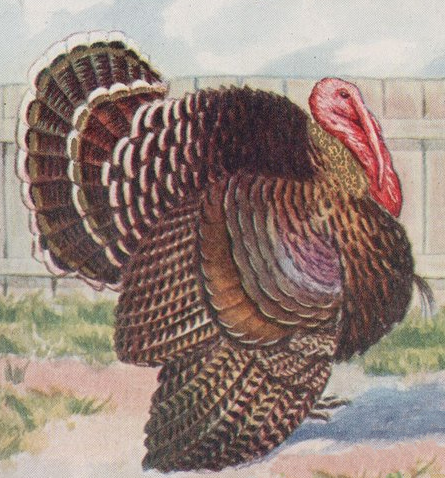 This proud turkey drawing comes from a vintage postcard. The postcard provided no clues as to the artist or publishing company. It does, however, bear a 1912 postmark. Clearly, a piece published prior to 1923. Fairly safe to say then, that this one is in the public domain in the United States. Our proud turkey drawing features a Tom all ruffled up and showing his beautiful feathers. His bright red head adds to his fierce countenance. His feathers are in shades of brown, purple, gray and gold. We find him standing tall in a yard, surrounded by tufts of grass and a white picket fence. Wouldn’t Tom make a wonderful addition of a children’s story or a Thanksgiving Day card?